If you open the driver’s door when the key is in LOCK or ACCESSORY , a warning buzzer will sound to remind you to take the key out. When this happens, the following messages appear on the multi-information display: • In LOCK : REMOVE KEY. • In ACCESSORY : REMOVE KEY. The buzzer will stop when you take the key out. 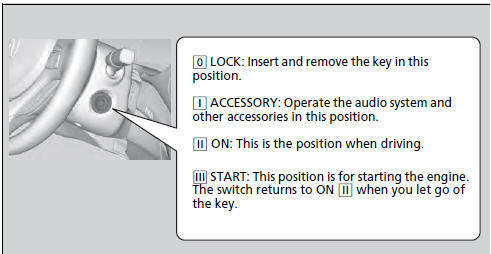 If the key won’t turn from LOCK to ACCESSORY , turn the key while moving the steering wheel left and right. The steering wheel will unlock, allowing the key to turn.